Twin Peaks: Fire Walk with Me is a 1992 French-American horror film, directed by David Lynch and written by Lynch and Robert Engels. It is a continuation of the short-lived television series Twin Peaks (1990-91), created by Lynch and Mark Frost, and revolves around the investigation into the murder of Teresa Banks (Pamela Gidley) and the last seven days in the life of Laura Palmer (Sheryl Lee), a popular high school student in the fictional Washington town of Twin Peaks. Additionally, the film's narrative references and clarifies Agent Dale Cooper's (Kyle MacLachlan) fate in the series finale. Thus, while the film is often considered a prequel, it also has features more typical of a sequel. Most of the television cast returned for the film, with the notable exceptions of Lara Flynn Boyle, who declined to return as Laura's best friend Donna Hayward (she was replaced by Moira Kelly), and Sherilyn Fenn, due to scheduling conflicts. Kyle MacLachlan, who starred as Special Agent Dale Cooper in the TV series, was reluctant to return out of fear of getting typecast, so his presence in the film is smaller than originally planned. 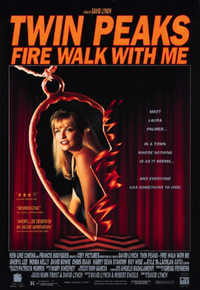 This webpage uses material from the Wikipedia article "Twin_Peaks%3A_Fire_Walk_with_Me" and is licensed under the GNU Free Documentation License. Reality TV World is not responsible for any errors or omissions the Wikipedia article may contain.